These products are among the most comfortable all-in-one pads on the market. If you have previously had problems with skin conditions or rashes with other products, MoliCare Soft All-in-Ones may help. They have a hypoallergenic formula that leaves skin feeling fresh and cared for without causing rashes. We have never yet had a complaint about these causing irritation. They also have plenty of other premium features to keep you feeling comfortable. The breathable side panels help air flow around the skin which will keep the wearer cool. 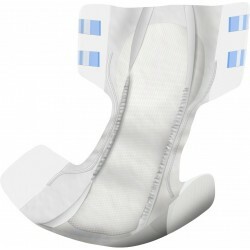 The anti-leak leg cuffs and anti-leak barriers keep leaks to a minimum, while the soft textile-like outer cover doesn't crinkle, so is suitable to wear out of the house under ordinary clothes while remaining discreet. Abena® Abri-Form Premium Adult Nappies Thes..